DWP - Who is Doug Wallace? Home > Who is Doug Wallace? With vast teaching experience at all levels, Mr. Wallace is in high demand as a music educator and clinician. Currently the Director of Percussion for the American Youth Philharmonic Orchestras in Annandale, Virginia, Mr. Wallace is an active percussion director, clinician and sectional instructor at several nationally recognized Fairfax County Public Schools. He is also proud to have been the first full time Professor of Percussion at Christopher Newport University, an up an coming music department located in Newport News, Virginia. Mr. Wallace's private students have been accepted to continue studies at The Juilliard School, the Curtis Institute of Music, the Cleveland Institute of Music, the New England Conservatory, Boston University, the Peabody Conservatory, the Eastman School of Music, the Oberlin Conservatory of Music, The University of Miami, and DePaul University. 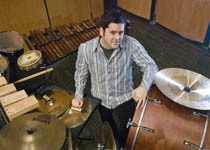 His teaching techniques are highlighted in his method book, Percussion with Class, published by FJH Music, and his compositions and arrangements have been performed at The Juilliard School, the Eastman School of Music, New York University, George Mason University, Christopher Newport University, the Music Academy of the West, the Aspen Music Festival, Temple University, the Noncert Chamber Series, the Music for All National Percussion Festival, the Virginia Music Educators Conference, and National's Park.